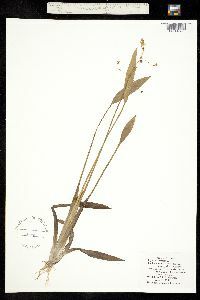 Sagittaria ambigua J. G. Sm. Herbs, perennial, to 90 cm; rhizomes absent; stolons present; corms present. Leaves emersed; petiole triangular, 15--54 cm; blade lanceolate to ovate, 5--20 ´ 1--10.5 cm. Inflorescences racemes, rarely panicles, of 2--11 whorls, emersed; bracts scarcely connate proximally, linear to lanceolate, 10--30 mm, delicate, not papillose; fruiting pedicels spreading to ascending, cylindric, 1.5--3.5 cm. Flowers to 23 mm diam. ; sepals recurved, not enclosing flower or fruiting head; filaments linear, shorter than anthers, glabrous; pistillate pedicellate, without ring of stamens. Fruiting heads 0.8--1.2 cm diam; achenes cuneate-obovoid, abaxially keeled, 1.5--2.1 ´ 0.8--1.5 mm, beaked; faces not tuberculate, wings 0--1, ± entire, glands absent; beak lateral, horizontal or incurved, 0.1--0.2 mm. Flowering spring--summer (Apr--Sep). Pond and lake shores, shallow water, ditches, and damp areas; of conservation concern; 100--1000 m; Ill., Ind., Kans., Mo., Okla.